Because this is a book on 'rehabilitation', it is mostly about children who are already disabled. However, preventing disabilities is also very important. For this reason, in most chapters on specific disabilities, we include suggestions for preventing them. Notice that we place the discussion of prevention at the end of each chapter, not at the beginning. This is because people are usually not concerned about disability until someone they love becomes disabled. Then their first concern is to help that person. After we have helped a family to do something for their disabled child, we can interest them in ways to prevent disability in other members of the family and community. We mention this because when health professionals design community programs, often they try to put prevention first-and find that people do not show much interest. However, when a group of parents comes together to help their disabled children, after their immediate needs are being met, they may work hard for disability prevention. For a community program to be successful, start with what the people feel is important, and work from there. When mothers do not get enough to eat during pregnancy, often their babies are born early or underweight. These babies are much more likely to have cerebral palsy, which is one of the most common severe disabilities. Also, some birth defects are related to poor nutrition during the first months of pregnancy. When babies and young children do not get enough to eat, they get infections more easily and more seriously. Diarrhea in a fat baby is usually a mild illness. But in a very thin, malnourished baby, diarrhea often leads to serious dehydration, high fever, and sometimes brain damage with fits or cerebral palsy. Poor sanitation and crowded living conditions, together with poor food, make diseases such as tuberculosis-and the severe disabilities it causes-much more common. Lack of basic health and rehabilitation services in poor communities makes disabilities more common and more severe. Often secondary disabilities develop that could be prevented with early care. To prevent the disabilities that result from poverty, big changes are needed in our social order. There needs to be fairer distribution of land, resources, information, and power. Such changes will happen only when the poor find the courage to organize, to work together, and to demand their rights. Disabled persons and their families can become leaders in this process. Only through a more just society can we hope for a long-term, far-reaching answer to the prevention of disabilities caused by poverty. Polio, in certain situations, can be prevented through vaccination. (However, effective vaccination depends on much more than good vaccine. See the box.). Why, since a good vaccine exists, is there still so much polio in so many countries? Production and supply of safe, effective, vaccine. (Cost of vaccine and of getting it to the children.) Leaders in poorer countries must decide that stopping polio is worth the expense. Knowledge of needs, planning, transportation, and distribution of the vaccine. People must understand the value of vaccination and want to cooperate. Health workers must know how important it is to keep polio vaccine frozen. Vaccination programs are most successful where the government fairly represents the people and has their full participation in country-wide vaccination campaigns. by breast feeding their children as long as possible (see Page 74). by not letting their children get unnecessary injections (see Page 18 to 21). Some birth defects and mental retardation can be prevented if mothers avoid most medicines during pregnancy, and spend the money they save on food. Spinal cord injury could be greatly reduced if fathers would spend on education and community safety what they now spend on alcohol and guns. Blindness in young children in some countries is caused by not eating enough foods with vitamin A. Again this relates to poverty. However, many people do not know that they can prevent this blindness by feeding their children dark green leafy vegetables, yellow fruits, or even certain weeds and wild fruit. Also, some kinds of deafness and mental retardation can be prevented by using iodized salt during pregnancy (see Page 276 and 282). Disability caused by poisons in food, water, air, or workplace. The recent, common, worldwide use of chemicals to kill insects and weeds has become a major health problem. Often villagers use these pesticides without any knowledge of their risks, or of the precautions they should take. As a result, many become paralyzed, blind, or disabled in other ways. To prevent these problems, people need to learn about the dangers, not only to themselves and their children but to animals, birds, land, and to the whole 'balance of nature'. Less dangerous ways to control pests give better results over time. Laws are also needed to prohibit the most dangerous products and to provide clear warnings. Stand so that wind blows spray away from you. Wear protective clothing, covering the whole body. Wash whole body and change clothes immediately after spraying. Do not let wash water get into drinking supply. do not use spray containers for food or water. Do not let children play with spray containers. CAUTION: Make sure that children, and women who are pregnant or breast feeding, stay away from pesticides. Poisonous foods in some areas are a major cause of disability. In parts of India, thousands of farm workers who are paid with a poisonous variety of lentils suffer paralysis from 'lathyrism'. The poor know the danger but have nothing else to eat. Fair wages and less corruption are needed to correct this situation. Fluoride poisoning (fluorosis), mainly from drinking water, is a common cause of bone deformities (knock-knees) in parts of India and other places. Public health measures are needed to provide safe water. The 4 biggest causes of 'crippling' in India, affecting over 2 million people, are reported to be polio, iodine deficiency, fluorosis, and lathyrism. Given the political will, all could be completely prevented! Dangerous work conditions, poisons in the air, and lack of basic safety measures result in many disabilities. These include burns, amputations, blindness, and back and head injuries. In some countries, the use of asbestos for roofs or walls in schools, work places, and homes causes disabling lung diseases. Strict public health measures and an informed, organized people are needed to bring improvements. The high cost, overuse, and misuse of medicines in general adds greatly to the amount of poverty and disability in the world today. Better education of both doctors and people, and more effective international laws are needed to bring about more sensible supply and use of medicines. Notice that many of the specific preventive measures we have discussed, just like the more general social measures, depend on increased awareness, community participation, and new ways of looking at things. These changes do not just happen. They require a process of education, organization, and struggle led by those who are most deeply concerned. Most able-bodied persons are not very concerned about disability or trying to prevent it. Often people think, "Oh, that could never happen to me! "- until it does. Those who are most concerned about disability are usually disabled persons themselves and their families. Based on this concern, they can become leaders and community educators for disability prevention. Or disabled children and families can join together to form prevention campaigns. In one village, mothers put on short plays to inform the whole community about the importance of breast feeding and vaccination. (See Page 74.) In Project PROJIMO, Mexico, disabled rehabilitation workers have helped to vaccinate children in remote mountain villages. In PART 1 of this book, where we discuss different disabilities, we also include basic information on prevention. We hope that those of you who use this book for children who are already disabled, will also work actively towards disability prevention. So far we have talked mainly about preventing original or 'primary' disabilities, such as polio or spinal cord injury. But the prevention of 'secondary' disabilities is also very important, and is one of the main concerns of rehabilitation. By 'secondary' disabilities we mean further disabilities or complications that can appear after, and because of, the original disability. This child, after polio, gradually developed contractures in her. The contractures (not the original paralysis) kept her from being able to stand or walk. If the contractures had been prevented through early and continued range-of-motion exercises, the child would have been able to stand and walk. Most contractures can be corrected. But it may take a long time and a lot of expense - perhaps even surgery. It is far better to: PREVENT CONTRACTURES BEFORE THEY START. Because contractures develop as a common complication in many disabilities, we discuss them in a separate chapter (Chapter 8). Range-of-motion exercises to help prevent and correct contractures are described in Chapter 42. Use of plaster casts to correct contractures is described in Chapter 59. Many other secondary disabilities will also develop unless preventive measures are taken. Some examples are pressure sores in children with spinal cord injury (see Chapter 24), spinal curve in a child with a weak back or with one leg shorter than the other (see Chapter 20), head injuries due to fits (see Page 235). Preventive measures for many other secondary disabilities are discussed in the chapters on the specific disabilities. To prevent these mistakes, it is essential to evaluate the needs of each child carefully, and repeat evaluations periodically. We must take great care to prevent further disability caused by treatment. In addition to secondary disabilities that are physical, others may be psychological or social (affecting the child's mind, behavior, or place in the community). Some disabled children develop serious behavior problems. This is often because they find their bad behavior brings them more attention and 'rewards' than their good behavior. Chapter 40 discusses ways that parents can help prevent tantrums and bad behavior in disabled children. The biggest secondary handicap for many disabled children (and adults) usually comes from the lack of understanding and acceptance by other people.PART 2 of this book talks about how the community can be involved in taking a more active, supportive role in relating to the disabled and helping them to meet their needs. In PART 2 we also discuss what disabled persons and their families can do, in the community, to promote better understanding and prevent disability from becoming a serious handicap. Prevention of secondary disability is a basic part of rehabilitation. The overuse and misuse of medicines in the world today has become a major cause of health problems and disabilities. This is partly because medicines are so often prescribed or given wrongly (for example, certain medicines taken in pregnancy can cause birth defects, see Page 119). And it is partly because both poor families and poor nations spend a great deal of money on overpriced, unnecessary, or dangerous medicines. The money could be better spent on things that protect their health-such as food, vaccinations, better water, and more appropriate education. Some medicines, of course, when correctly used are of great importance to health. But most are not. Of the 30,000 medicinal products sold in most countries, the World Health Organization say that only about 250 are needed. In many countries, injections have become the 'modern magic'. People demand them because doctors and health workers often prescribe them, and doctors and health workers prescribe them too often because people demand them. 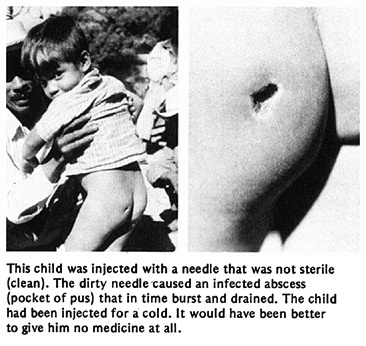 Giving injections with an unclean needle or syringe is a common cause of infection. Sometimes these infections can lead to paralysis, or spinal cord injury (see the story on Page 192), or death. Also, some injected medicines can do harm. Dangerous allergic reactions, poisoning, and deafness are sometimes caused by injecting certain medicines - often when they are not needed. Overuse by doctors and midwives of injectable hormones to speed up childbirth and 'give force' to the mother has become a major cause of babies born with brain damage, cerebral palsy, and fits in many countries. The disability most often caused by injections is paralysis from polio. Some experts say that each year up to 2 million children are paralyzed by polio because of injections. Nearly all of these injections are given when they are not needed. It happens like this. Children who are infected by the polio virus usually only have signs of a bad cold or 'flu'. Most get well in a few days, without developing paralysis. But the risk of paralysis increases if the child's muscles are injured or irritated. Injections of any kind of medicine irritate the muscles. Messages from the irritated muscles travel up the nerves to the spinal cord, and cause changes that let the polio virus produce paralysis. Unfortunately, when children develop a cold or 'flu' caused by the polio virus, their parents often take them to a doctor or health worker for an injection. Many times the result is paralysis, which is usually worse in the leg on the side that was injected. Many people used to think that paralysis in a leg after an injection was caused because the needle 'hit a nerve'. We now know that in most cases the paralysis was caused by polio. Because it was brought on or 'provoked' by an injection, this is called 'provocation polio'. It is very important that mothers-and doctors-remember that children should not be given injections when they have signs of a cold with fever or 'flu'. It might be polio, and an injection could bring on paralysis. If injections are given to children only when they are really needed, millions of cases of paralysis from polio could be prevented. The worldwide epidemic of unnecessary injections each year sickens, kills, or disables millions of persons, especially children. An international campaign is needed to re-educate doctors, health workers, traditional healers (many of whom also now overuse injections), and the people themselves. Combating misuse and overuse of medicines is as important a preventive measure as is vaccination, clean water, or the correct use of latrines. Health workers, schoolteachers, and community organizers should all work to 'de-mystify' or take the magic out of injections, and to help people always to weigh the possible risks and benefits before using any medication. For skits and ideas on teaching people about the danger of unnecessary injections, see Helping Health Workers Learn, Chapters 18, 19, and 27. Note:When used correctly, certain injected medicines are important to health. Vaccinations, including those that are injected, are very important to protect a child's health and prevent disability. However, to avoid paralysis from polio, it is best not to give vaccinations (immunizations) or any other injection when a child has a fever or signs of a cold. This could be a mild polio infection, and giving an injection could cause paralysis. Armed violence is increasing. Since 1980, 45 countries have been involved in 40 wars, with over four million soldiers. In today's wars, more civilians than soldiers are killed or disabled, and most are women and children. In World War One, only 5 percent of persons killed or injured were civilians. Today, 80 to 90 percent are civilians. At least 3 times as many people are injured as are killed. The increased poverty and 'hard times' caused by war also lead to many disabilities. There are 25 to 30 million refugees, many living under dangerous and unhealthy conditions. One- third of the world's children lack adequate food and basic health care. Millions are homeless. Yet in 1985, world leaders spent 1,000 billion US dollars on war and arms-twice as much as in 1981. War, terrorism, and torture have become tools of the powerful for economic, political and social control. When the peoples of poor countries dare to get rid of their dictators and form popular governments that work toward fairer distribution, the rich, powerful countries often try to destroy those new governments. They pay for terrorism, long wars, and the destruction of schools, health centers, and production. The result is still more poverty, disease, and disability. Terrorism is too often fought with terrorism. During the U.S. attack on Libya in April, 1986, bombs hit a school for disabled children. Such actions do not stop terrorism; they merely kill and disable innocent persons. "AN EYE FOR AN EYE WILL MAKE THE WHOLE WORLD BLIND." - Mahatma Gandhi. To help change this situation, we disabled persons of the world must join with all who are disadvantaged or treated unfairly, to struggle for a new, more truly human, world order. *Note: Although too much fluoride is harmful, some is necessary for healthy bones and teeth. In some areas fluoride needs to be removed from drinking water; in other areas it needs to be added.